Really, it started last night. When I got home from work, we had a picnic in the backyard. While Sasha and Mackenzie went to get the food. Mady and I laid on the trampoline and looked at the clouds, the moon and the birds in the trees. It was an awesome night. Today, we got up and drove to Shreveport/Bossier City. We have heard about the Louisiana Boardwalk, but have never been. It is an awesome place with outlets and great restaurants located in Bossier City on the Red River. 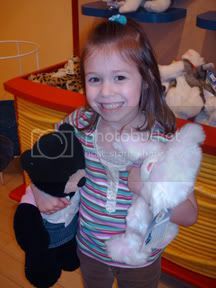 While we were there, we went to Build A Bear Workshop. When Mady turned three, we were living in Oklahoma City. 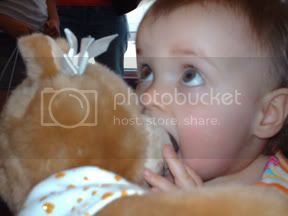 It was then that we started a tradition of getting Mady a Build a Bear for her birthday. When we left the city to move to Atlanta, Texas, we knew that this was a tradition we would have to work on to keep. 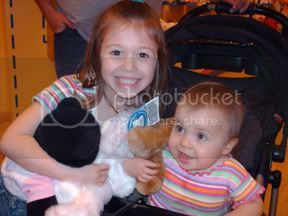 So, today, we took the girls to Build a Bear to get their Birthday bears. The Girls With Their New Bears! 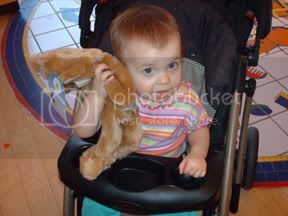 Mady with her first Bear, "Bananas," and her new Bear, "Pinkalicious!" 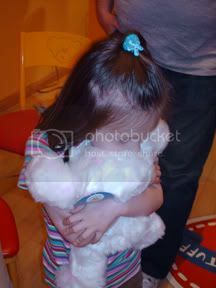 Mackenzie hugging her new Bear, "Snuggly Bear!" Mady checking "Pinkalicious" to make sure she has enough stuffing! While we were standing in line to get the bears stuffed, we heard this girl scream "Oh my, look who we are standing next to." I turned to see what famous person was in the room. To my surprise, she was talking about me. It was a girl who had been in our Youth Ministry in Nacogdoches. We have not seen her in probably seven or eight years. It was great seeing the Gaudettes again. After Build A Bear, we had lunch at San Francisco Oven, shopped at the outlets, retraced our steps several times to look for Kenzie's sippy cup and other lost items, got ice cream from Cold Stone Creamery and looked at the huge fish in the aquarium at Bass Pro Shops. After spending five hours on the Boardwalk, we left and found an incredible area of Shreveport. We needed a Target to purchase some diapers. So, after some searching on my Palm, we found a Super Target on the south side of Shreveport off of Youree. When we drove up to the area, we found some great restaurants and lots of great shopping. When we were pulling up to the Super Target, we noticed a great surprise directly across the street. 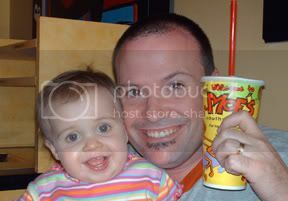 It was one of our favorite restaurants, Moe's Southwest Grill. Since it was almost six when we finished at Target, we made our way across the street for some sweet tea, tacos and queso. Since I wasn't real hungry, I broke with the tradition of getting the "Homewrecker." Instead, I tried the John Coctostan (Moe's tribute to Fletch). The Johnny C. is a great quesadilla.